Worn out pitches can be renovated to extend their useful lifetimes. We currently offer 3 methods, which can be used individually or successively for the perfect makeover! Renovation can also include POA removal. Sand dressing simply applies up to 10mm of sand to an existing surface. This greatly improves the surface structure of the soil and increases the surface drainage. 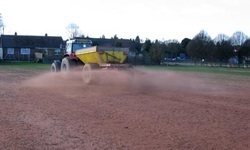 Sand dressings are commonly applied to ensure that pitches do not become capped with the drains sealed over. Each dressing uses between 30-100 tonnes of sand, depending on the size of pitch. A typical top-dressing application rate of 10kg/m2 equates to 60 tonnes on a 6000m2 football pitch, or a depth of 5mm on the surface. Pitches become compact over time or with regular use, and therefore need de-compaction. We offer three methods of de-compaction: Verti-draining, earthquaking, and Twose Turf Conditioning. Here, the verti-drain machine spikes and heaves the ground to aerate the roots, improve the soil structure and root development, and also improves the drainage. It uses 3/4 or 1" spikes down to a depth of up to 250mm. This picture shows the pitch surface following a dressing of sand and a verti-drain. Wear and tear to a pitch results in loss of grass leading to bare pitches! Most pitches need some overseeding every year, usually in the goal mouth and centre circle. This is done with the seed drill. The seeded area will then be fertilised to increase the growth rate and establish the grass more quickly. The seed drill applies the seed evenly. Poa annua (annual meadow grass) is the commonest weed grass found in lawns and sportsturf. It is a nuisance to sports pitches because it is shallow rooted and therefore does not have the wear tolerance of rye grasses, and is evasive and competes with the rye grass. To completely irradicate poa we can remove the top 10-15mm of grasses using the Koro-topmaker. This removes the shallow rooted poa grass and leaves the roots of the other grasses to come back following the full renovation. On completion of poa removal the above 3 stages of renovation can be performed and the pitch left to re-generate. With appropriate feeding and watering the pitch will be playable in 10-12 weeks.